The phrase 'buy one get one free' can be music to the ears of consumers but doesn't often apply to expensive devices like smartphones. For that reason, this deal from Verizon is looking pretty sweet. Getting in on the Valentine's Day spirit early, the carrier will give you 2 brand new phones if you trade in your current one. That's a phone for you, and one for your other half, perhaps. You might expect to see older or less desirable phones as part of this deal, but that's actually not the case. 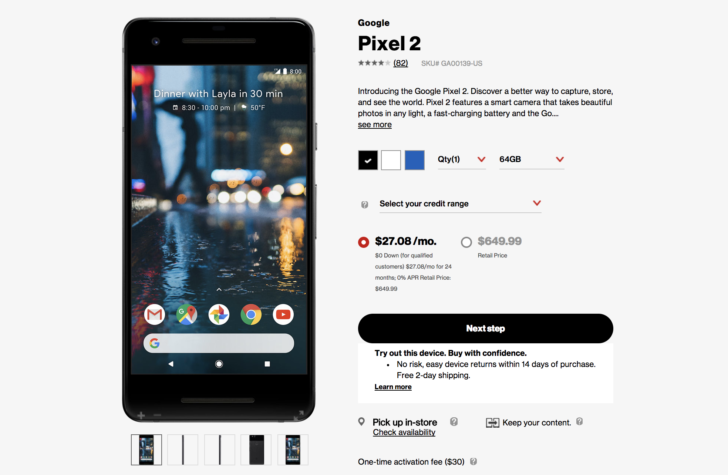 Verizon is offering up the Google Pixel 2 or 2XL, Samsung Galaxy S8 or S8+, Moto Z2 Force, or LG V30. You do have to take two from the same manufacturer, and if you choose a Pixel 2 XL or Galaxy S8+ you'll have to settle for the respective little sibling of each as the free phone. Even so, if you were already planning to get a new phone on Verizon and you know someone else who wouldn't mind upgrading, this could be ideal. Trade in your phone within 30 days. You will receive the trade-in value in addition to the bill credits. Credit amounting to the price of one phone will be applied to your bill over the course of the 24-month contract. Both new customers and current Verizon customers are eligible, but it will only be available for a limited time so hurry up if you want to make the most of it. Check out this deal on the Verizon site.